These big mallet putters are getting out of hand. This putter to me looks like the head of "I, Robot." If I owned this putter, I would constantly be trying to talk to it as it stared at me from my golf bag. "What do you think, Putter, should I go for the green or lay up?" The TaylorMade Rossa Monza Spider Putter is a heel shafted mallet putter designed to give you a forgiving club with a high MOI. The frame is a heavy steel wire, while the core is a light aluminum. This brings the weight to the perimeter, giving the club the desired MOI. The best thing about this club (besides that you can talk to it) is TaylorMade's insert. This "Anti-skid Groove System Insert technology features 14 tightly positioned grooves." This gives the putter a soft feel, while promoting a forward spin and smooth roll. That's all I can say positive about this putter. At address, it's hard to look at. It's bodacious, bulky, and black. 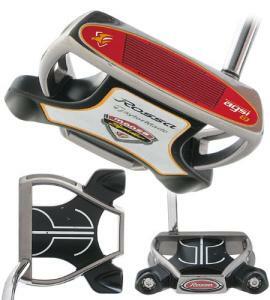 Do yourself a favor and check out the Odyssey White Hot XG 2-Ball F7 Putter. This is a 2-Ball putter, except Odyssey added two weighted alignment wings. The wings are straight, giving it a square look similar to the Rossa Monza. I also like the multilayer insert which gives the putter a very soft feel. I think you will like this White Hot 2-Ball F7. But if you don't believe me, just ask the Rossa Monza Robot. "What do you think, Putter?"